With the very short and very brief burst of warm weather I experience last week, I realized it's time to start thinking about my spring wardrobe! And since I scooped up about 3 crop tops last fall, I am ready to start thinking up how I want to style them come warm temps.. oh and probably 2-a-day workouts to go with them. I've also found some amazing options that you can pick up right now! I love the idea of a textured crop top with a simple maxi dress. Add a bold accessory and a super fun pony and you've got an instant summer date night outfit. Another awesome casual version involves printed pants and a denim vest. This will help you feel more covered up if you're worried about showing too much skin. I never thought I could pull off the whole crop-top-with-denim-cutoffs look. But this look totally makes me think I can with the oversize shorts and flat sandals. I kind of don't know where to begin this post. The event I hosted last week at The Impeccable Pig was SO. MUCH. FUN! It was so wonderful to meet some new people here, catch up with old friends, pick out birthday presents, style customers. I mean if I could do that every single day I think I would be a very happy gal. P.S. I'm wearing the Neon Coral Shift Dress (that I just HAD to have) from their new in-store arrivals. Here are some photos from the event. The store was so busy that I didn't get to take a ton of the action but a very big thanks to everyone who came out to support IP and BAD. I am so lucky to have readers, friends and family like you!! Delicious sweets were provided by The Cupcake Shoppe Bakery. YUM! When I first moved back to North Carolina I was concerned that I would never have any fashion events to attend.. and [thankfully] was I SO wrong! I'm really excited to share with you about this upcoming event The Junior League of Raleigh is hosting! If you're in the Raleigh area, plan to be at Belk's Crabtree Valley Mall location on Sunday March 9th from 5 - 10 PM. There will be a fashion show around 7 PM with VIP shopping starting at 5 PM. And of course, there will be an exclusive discount off your purchase when you attend, food & drinks, Belk Gift cards and more! Plus designer Trina Turk will be there to talk about her new spring line and you won't want to miss the opportunity to meet her! Tickets are on sale now and can be purchased on the Junior League's website. I'll be there getting my shopping on, enjoying some fashion and meeting you! I really hope to see you there! 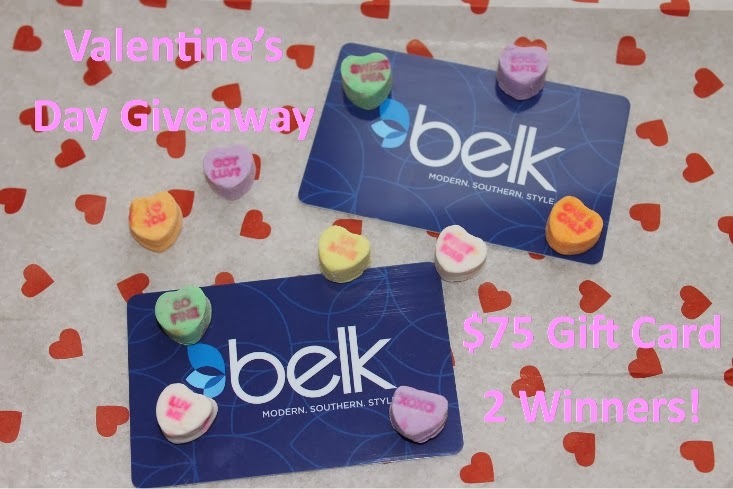 It's time to announce the TWO winners of my Belk Valentine's Giveaway!! I know how excited you guys were about this one. And as always your support of BAD continues to amaze me. I love each and every one of you!! J.Crew Pave Link Bracelet (on sale!!) || BCBGeneration #MYO Affirmation Bracelets c/o Belk || ILY Couture Candy Color Necklace (sold out - similar option) || Maybelline Vivids Lipstick in "Vivid Rose"
Happy Valentine's Day!! I think that as I've gotten older I realize how fab it is to celebrate V-Day with not just my husband, but my family & friends too! It's a fun to be reminded of all the people in your life who you love and not just who you're in love with :) So, what better way to celebrate that day of love than a big pink ball of tulle! 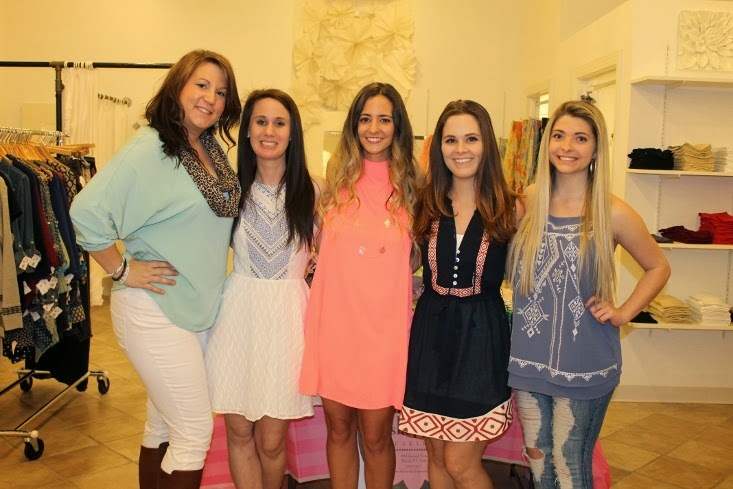 I am so in love with Space 46 Boutique, the new online shop I discovered this past fall. My, the owner, has an amazing vision for all things feminine and it really shows in the designs of her gorgeous skirts. I have 2 and always receive A TON of compliments whenever I wear them. Hope you and your Valentine have a wonderful celebration together! I've spent my last 10 years living in sunny and warm cities in Florida and California. After being back here in Raleigh for the last 9 months or so, I have finally come to terms with the fact that I actually need a winter wardrobe. Which means a real winter coat and a real pair of weather proof boots. 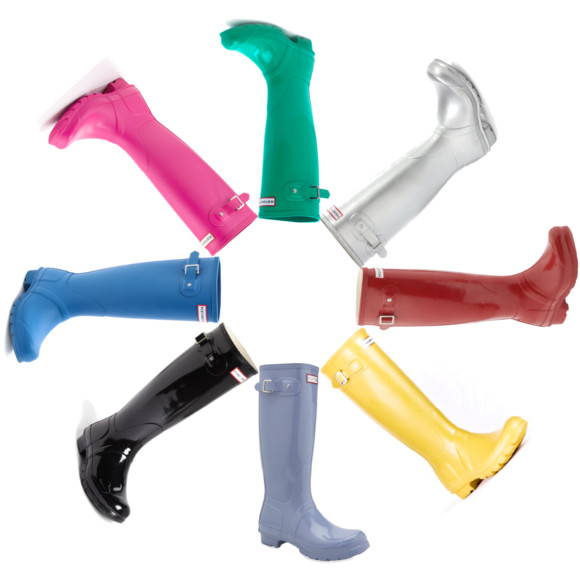 I mean it's been raining here all year and with this last blast of winter snow, I have decided to invest in a pair of Hunter Wellington Boots. Now if I just decide which color to get..... Should I go classic black or a bright shade of yellow? What about my signature color pink or a metallic pair? Too many decisions - help! Speaking of my current wish list - have you entered my giveaway for 2 Belk $75 gift cards? Oh yes that means two winners! I'm kind of surprised by how attracted to this style I am but I have definitely gone from hate to love. For some reason, I just can't get the thought of a wide leather front and chunky heel out of my head. I think the best part about this 90's revival are the modern touches like laser cutouts, pointed toes or a splash of metallic. Lucky for you I've picked out some options that are sure to fit any one's budget. So what are you guys thinking about this style? Are you willing to try it or do you think you'll leave the mules of the world to Nana? Listen up Raleigh/Durham/Chapel Hill Ladies! I'm hosting an event next week and I want to meet you!! Let's forget about this stupid Polar Vortex and get your closet ready for spring! 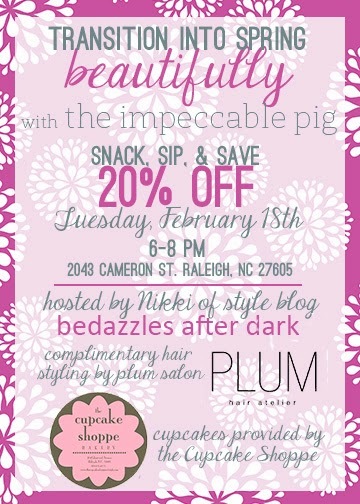 Come by the Impeccable Pig Cameron Village location Tuesday February 18th from 6 - 8 PM and shop with me! I don't know about you but I'm ready for shorts, sundresses, tees and tanks! You'll get 20% off any regular priced merchandise along with complimentary hair styling from Plum Atelier Salon. 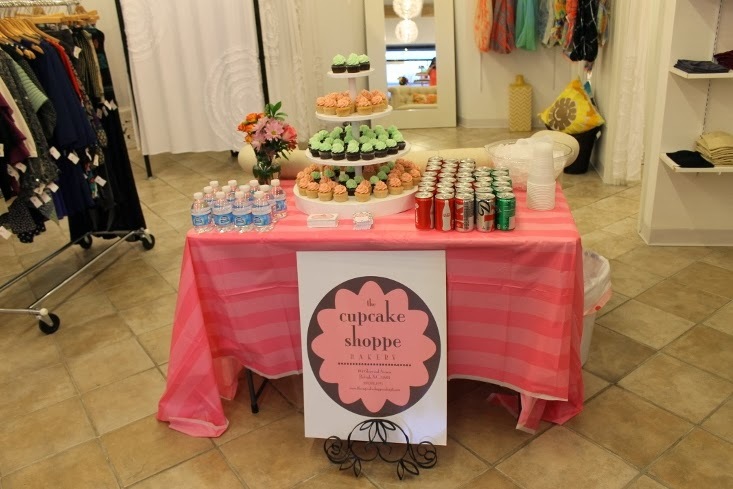 Plus there's going to be sweet treats from The Cupcake Shoppe! Yay! So let's play together!! I REALLY hope to see you there! Outfit Post: Valentine Hearts + A Belk Giveaway! Hello Monday and the start of Valentine's Week! Any excuse to dress up in pink and eat candy is certainly fine by me! Plus it's the perfect time to break out both my color block sandals and heart print sweater! :) After creating a little wish list at Belk, I was able to go pick out a few items for a little V-Day present to myself! And to make this Monday SUPER special - I've got a giveaway just in time for Valentine's Day! Disclosure: This post was sponsored by Belk. 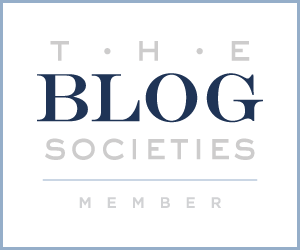 As always, the opinions expressed herein are those of the author and are not indicative of the opinions or positions of Belk. Giveaway is open to **U.S. residents only**. Up to 20 entries per person. Winner will be chosen at random via Rafflecopter generator. Giveaway ends at 12:00 AM [midnight] PST on February 17th, 2014. I will announce the winners in a blog post. The winner must respond within 3 days of announcement to claim the prize. If there is no contact by the 4th day or the winner did not follow the entry rules (i.e. is not a follower) I will choose another winner at random. Tomorrow, Friday February 7th, is National Wear Red Day in honor of supporting the fight against heart disease. Did you know that it's the #1 killer among women in the United States claiming more lives than all types of cancers combined?!? I was most definitely surprised to discover that information. Each February, the American Heart Association hosts a live-streaming fashion show to help raise awareness. You can find out more information here. I've selected a few ways that you could wear red tomorrow to show your support and help spread the word. Whether it's a full on red dress or just a hint of red nail polish, I encourage you to put your own personal twist on this fabulous challenge. Don't forget to Facebook, Tweet & Instagram about it using the hashtags #GoRed #WearRedDay or #GoRedChallenge. You can also tweet at the cause @GoRedForWomen. I can't wait to see what red pieces you rock tomorrow! P.S. this is not a sponsored post but a cause that I care very deeply for! I hope you'll participate on Friday! If there's one thing I love in my wardrobe, it's a piece that can be worn season to season. After all, we've got to make the most of what's in our closet, right? 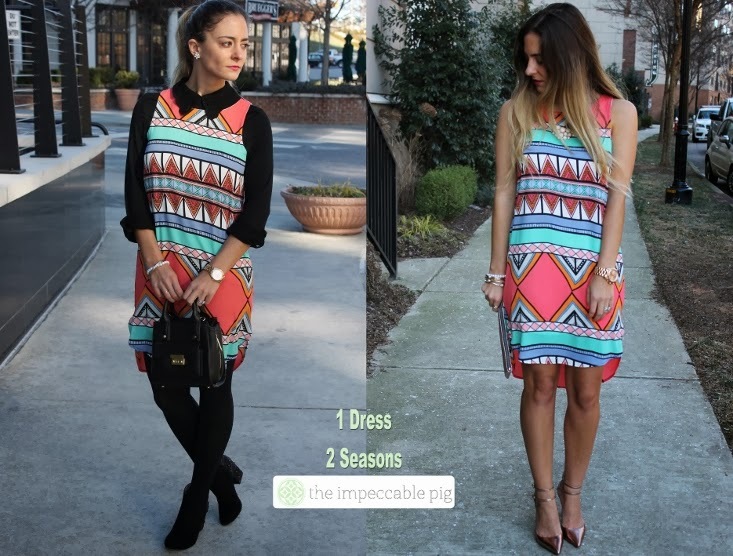 When I saw this tribal print dress at The Impeccable Pig, I knew I had fallen in love with it. However, our freezing temperatures weren't exactly making this frock winter friendly. So read below on how I came up with the idea to make this bright and bold beauty February appropriate. It's really fun to transition a summer piece into winter because there are so many different ways to style it. As you can see, layering is the key factor here. My thick tights and super cute long sleeve collared blouse turn this bright spring dress into a perfectly warm winter look. Originally I had wanted to do a chambray underneath (another helpful trick for spring pieces during winter) but the black top just made the outfit look much cleaner and sleeker. I think the lace detail on the collar also helped - this would be a great shirt with a pair of jeans and heels. For spring, you really can't go wrong. 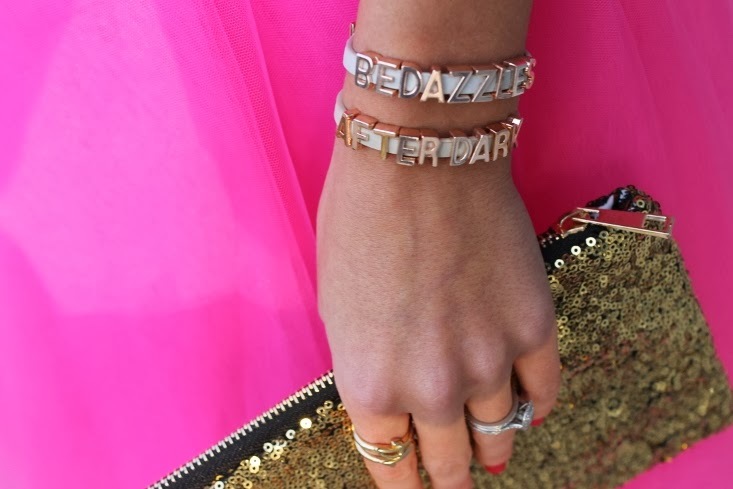 The colors are so bold and fun so I wanted to amp them up with rose gold details like my strappy pumps and clutch. Can I just say I'm ready for spring temps? !Enough of these freezing temps already! What are some of your favorite ways to transition pieces from season to season? Oh and did I mention that this dress and top are now available on The Impeccable Pig's online store?! Lucky you!